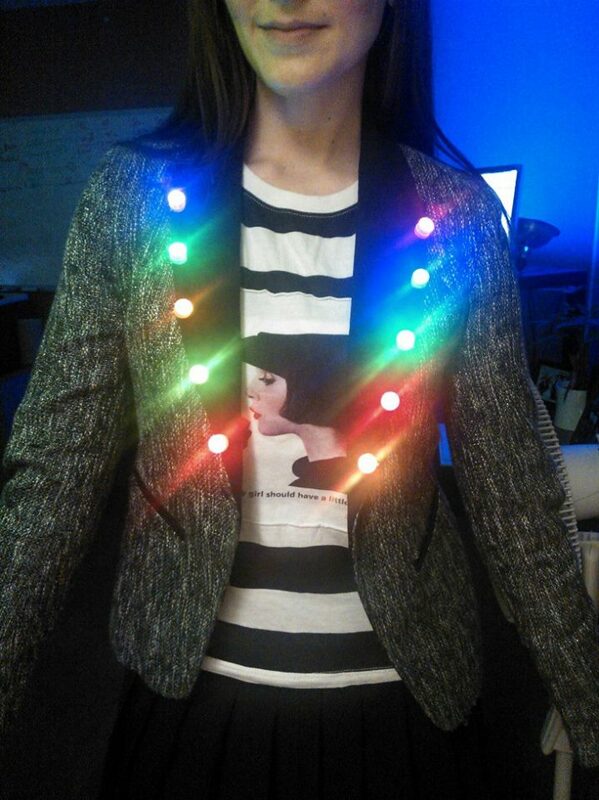 Make Your Own LED Clothing! Yes You Can! That’s 3.5 minutes to unwrap each LED light, 0.5 minute to pull out their safety tabs, and 1 minute to clip them on equal distances apart. YOU’RE WELCOME, world. If doing this for a play, a production, for Cosplay, or just an extra-crazy night out, reinforce your LED lights with simple thread & needle so you don’t knock ’em off during your sweet dance moves. Another alternative is our fairy lights! They come in blue, white, pink and multicolor. They come with a thin battery pack so it’s easy to tape and hide, the wired string lights make it easy for you to sew or just wire into your clothing. When the party’s over & it’s back to business for your suit jacket or what have you, snip each thread loop & disassemble your homemade LED clothing…though you may not want to…and that’s OK.
Til next time, light loves!